And here I was, trying to post every 2-3 days. 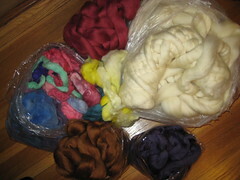 Over the last week, I've picked up more materials for better photography (still waiting to pick up my tripod) and dyeing, and it's just possible I bought more wool as well. 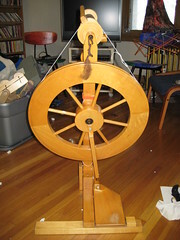 It's just that the spinning's going so fast and fun, I keep wanting to do more. 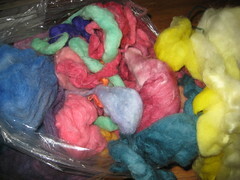 Spinning the alpaca/sari silk has been interesting. My first real novelty yarn. 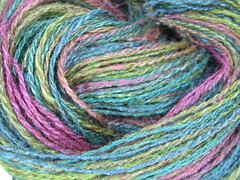 I spun a couple of ounces, then tried to ply it, and really disliked how it turned out. Meanwhile, I've got some black merino that I was spinning very slowly and was not looking forward to continuing in the same method. 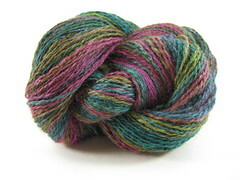 The lightbulb went on, and I plied the alpaca/sari silk with the merino, and it was exactly what I wanted! 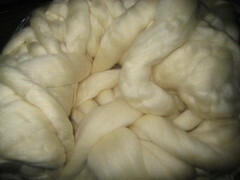 I'm 2/3 done with it - another 2-ish ounces to go, then on to the other alpaca silk blend. I may have underestimated myself. 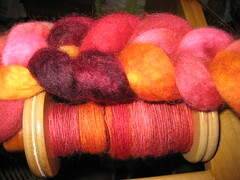 For the Tour de Fleece, I challenged myself to spin three skeins of yarn. I finished the first two in two days. They were smaller, so just over half of the total weight. The turquoise is much more vibrant in real life - a deep turquoise, kind of mediterranean. 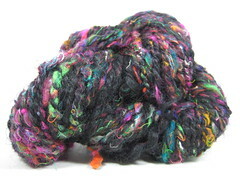 I have about 7 oz of this, so two larger skeins. Something around a sport-weight, maybe. If I finish that, I'll set new goals, keeping in mind two hindering factors: I'll be starting a new job on July 21, and will be out of town on the last three days of the Tour de Fleece (and away from my wheel... probably... unless I bring it with me...) . Wait, that's horseracing. "Start your engines" is for cars. I don't know what it is for biking or spinning. 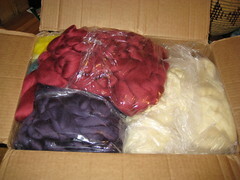 I'm participating for the first time in Le Tour de Fleece. It's a personal spinning challenge that corresponds to the dates of the Tour de France - July 4 - July 26. 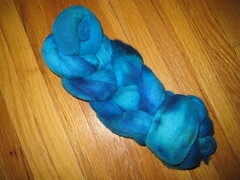 I've set myself a goal of spinning three braids of merino, a total of 8.5 oz. The results will be sold off in the shop. So I've got three braids - turquoise, red (dyed by Extreme Spinning), and pinks/purples (dyed by Maude and Me). I'll be starting a new job and going to a wedding in the Chicago area towards the end of the tour, so that will add to the challenge. 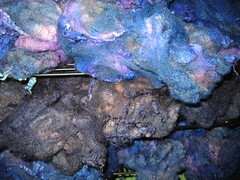 And some of the blue CVM in progress (dyed and drying). At the top is Copenhagen Blue, with some purple; middle is Navy Blue; lower is Blue. More dyeing and spinning planned for today, and I've got three skeins drying that have been long overdue for the finishing process. Since I've got two spinning groups in the next three days, I wanted to get them done for show and tell. 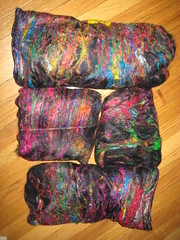 Two of the skeins will be for me, and one will be for the shop. 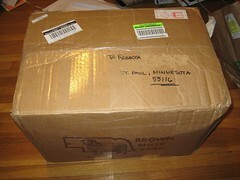 I've sent off my Certificate of Assumed Name to the Secretary of State - in a few weeks, you can legally call me The. Well, The Spinning Daisy, anyway. I'm hoping to have my logo finished by next week. For myself, I'm dyeing up a bunch of fiber for a sweater project (Twyla on Ravelry) - I've got some gray CVM and gray alpaca that I'm dyeing assorted shades of (mostly) blue and will then card together. 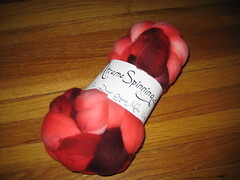 Meanwhile, I'm spinning some pre-dyed black merino for another project. 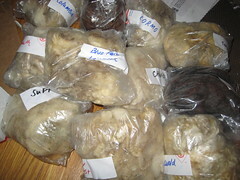 And I'm awaiting some white merino fleece, which will probably arrive early next week. My name is Rebecca, and I'm in the process of starting a new business. 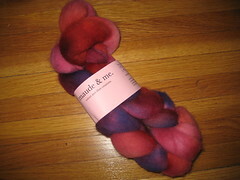 I plan to sell hand-dyed and/or handspun fiber and yarn. 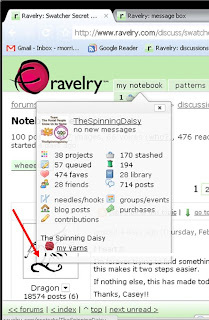 I'm getting the pieces, such as a blog, in place now. Still to come: logo, tax documents, shop. But the website is in place (if not yet interesting). As the pieces come together, I'll be updating here. I'll also be posting about my fiber-related activity, other people's creativity, sites I like, and whatever else comes along that I want to share.